It has been a difficult year for the Rohingya refugees in the country. While a recent verification exercise by the police at multiple Rohingya settlements across the country has made them nervous about their future here, their requests for renewal or fresh long-term visas have been put in cold storage. And that all of this comes in the backdrop of shrill noises from the government and other sections that have been labelling them as illegal immigrants and calling for their deportation has added to their apprehensions. The government has clearly said that it would like to deport this group of refugees. And no long-term visa clearly leaves them more vulnerable according to experts and activists involved with this community. There is a virtual freeze on the long-term visas, Rohingya refugees in Delhi claim. “I applied for the renewal of my visa in May. I have not heard anything from the Foreign Regional Registration Office (FRRO) yet,” says Zubair Ahmad. At the Shram Vihar camp in South East Delhi, not very far from the Kalindi Kunj Barrage, Ahmad is one of the many Rohingya families who live shanties. “Last time it was not so difficult. It took about a month. This time it has been six months,” he says. 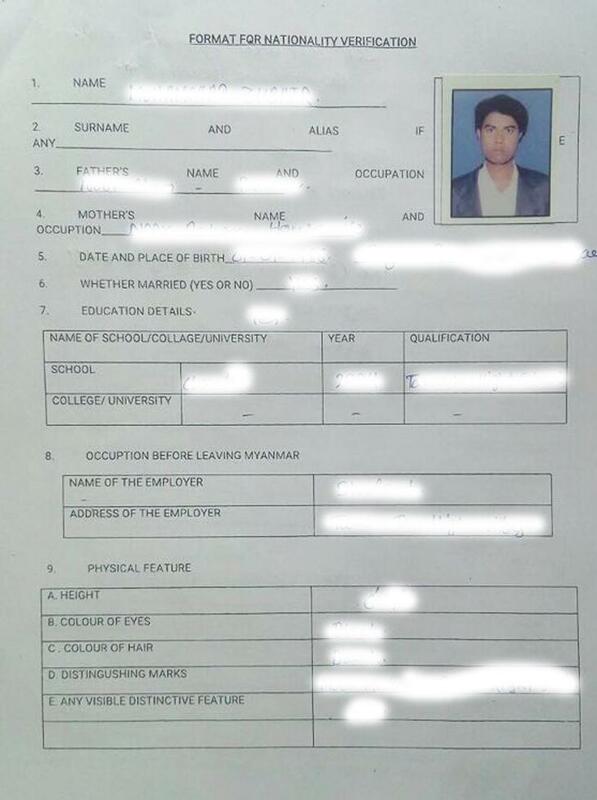 Nurul Amin, another Rohingya refugee, showed his application form for the long-term visa. It showed the file was submitted on 8 March 2017. He, too, is yet to hear about the status of his request. Zubair claims none of the Rohingya at the Shram Vihar camp who have applied for long-term visas in the last many months have not got it. While many have passed the one-year renewal deadline with their applications pending with the FRRO, others are apprehensive as their one year term gets closer. “I do think they will renew mine since nobody has been able to get it this year,” Maulvi Abdul Rahim says, sitting at his makeshift shop. His visa is due for renewal on 2 December. Most Rohingya refugees at the Shram Vihar camp were given long-term visas (LTV) since the government started issuing them in 2012-2013. Even those outside living outside Delhi are having a hard time getting LTVs. Shamsul Alam, who lives in Faridabad, claims he applied for a fresh LTV six months back but his application is still pending. “I have a refugee card issued by the United Nations High Commissioner for Refugees (UNHRC). I went with it and submitted my visa form,” he says. A Ministry of Home Affairs spokesperson says there is no change in policy and mere pendency of their applications does not mean that the government’s policy on LTVs has been amended. Meanwhile, this entails that this group of persecuted people who have been often called the most persecuted community in the world can only speculate about reasons why the government has suddenly turned cold towards them. “I suspect it is because the case regarding the status of Rohingyas in India or if they should be allowed to live as refugees is pending in the Supreme Court,” Rahim says. Residents of the camp say they have heard of similar exercises in other camps across the country as well. “The police told us that they have been asked by their superiors to do it,” Zubair says. “It is perhaps because while the government is saying there are 40,000 Rohingyas, the UNHCR figure stands at 16,000. They want to find out the actual numbers,” Rahim intervenes adding how they cooperated with the police. UNHCR, the refugee agency, however, is clueless why such an exercise is taking place. Albeit, such an exercise has happened in Hyderabad before where the police had done similar verification checks. “Refugees in different locations have reported that they are being asked to fill verification forms by local police. During field monitoring visits to some locations, UNHCR was informed by local authorities that this is a routine exercise,” the agency said in a response to a query by Catch. Interestingly, the recent pact between Bangladesh and Myanmar over repatriation of the refugees too entails filling up of a detailed form which will be sent to Myanmar and verified by the authorities according to recent reports. Meanwhile, the pendency of LTV, too, entails more vulnerability for this group of refugees. “We get nothing as it is which we are entitled to because of our status as a refugee,” Hafiz Ahmad says flashing the back of his UNHCR refugee card which details the rights of the refugee community. While they have grudges with the UNHCR, no LTV from the government of India means one less layer of protection and the refugee card issued by the UNHCR remains the only document to support their stay in the country. A hostile attitude from the government has also led to more problems locally. In the Rohingya camp in Mujeri village in Faridabad for example, the 36 families are finding it hard to continue working. “I worked as a scrap collector. But I had to stop since the locals threatened us,” Mohd Rashid says adding how the locals snatched a cycle rickshaw from one of his refugee neighbours. On Eid-ul-Zuha, Rashid was among the group of Rohingyas assaulted by the locals over the slaughter of buffaloes. “We never faced any problem before. But such elements have become emboldened after the government started talking about us in a certain manner,” Rahim explained. In the past three months, locals say, three Rohingya families from Jammu, another place where the refugee community is seen with contempt, have resettled fearing persecution. According to a former official who has served in Yangon, the government's attitude and talks of deportation are basically meant to send a message to dissuade more Rohingyas trying to come to India. Is this policy succeeding with fewer Rohingyas trying to enter India from Bangladesh which now houses over a million refugees? Hafiz Ahmad says that is indeed the case. Apart from increased security on the border, “In Bangladesh, people are at least getting rations and they live in designated camps. Here in India, there is no ration and no certainty over how long the government will allow us to stay,” he says. It takes ten thousand to fifteen thousand rupees per person to undertake the travel from Bangladesh to India. “Who is going to risk that kind of money in these hostile times?”he asks.